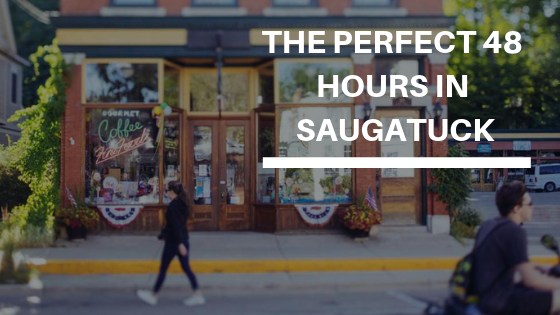 Are you traveling to Saugatuck, Michigan but only have 48 hours? Luckily, Saugatuck is ideal for a quick trip or weekend getaway. You’ll be busy, but it is possible to experience Saugatuck’s incredible art galleries, pristine beaches, and farm fresh local dining in just two days. Follow this itinerary for the perfect 48 hours in Saugatuck. By the end of it, we promise you’ll want to extend your stay or book a return trip as soon as you can. Start off Day 1 with a delicious homemade breakfast at the Twin Oaks Bed & Breakfast. Our menu is always changing, so you might enjoy fresh quiche, gourmet french toast, or fluffy waffles, always served with coffee or tea, juice, and a side of fresh fruit. After breakfast, take a stroll down Butler Street, Saugatuck’s Main Street. This is a great way to kick off your trip and get a taste of Saugatuck’s small town charm. Butler Street is filled with great antique shops, art galleries, and restaurants. Foodies will love the American Spoon, Spice Merchants, and the Butler Pantry, where you can stock up on quality spices, herbs, teas, jam, and a variety of state-of-the-art kitchen tools. Brass Anchor Co is a great place for fashionable clothing and jewelry. Grab lunch at Pumpernickels, a bright and modern restaurant in downtown that serves tasty wraps, salads, sandwiches, and fish tacos. Afterwards, be sure to enjoy an ice cream cone at Charlie’s Around the Corner. After getting your fill of arts & culture for the day, it’s time to taste some incredible West Michigan wines. Head to Fenn Valley Vineyards, a world-class winery located on the beautiful Fennville Estate. During your visit, you can sip wine on their gorgeous patios, stroll through their production vineyards, or picnic on their lovely and peaceful grounds. If you have the time, be sure to take one of their fun and educational tours. If you’d rather stay in town, swing by Crane’s Wine Bar in downtown Saugatuck. They specialize in local wine, cider and food pairings. Crane’s is also a bakery and a restaurant serving mouthwatering pies, cinnamon rolls, muffins, cookies, apple cider donuts, and more. Enjoy an afternoon snack in their lovely dining room surrounded by historic memorabilia and antiques. End your day with a delicious meal at Wick’s Park Bar & Grille, a stylish and lively eatery located near the banks of the Kalamazoo River. Their outdoor seating area is one of the best in town, with great views of the water. Their menu has pretty much everything, including fresh lake perch, homemade burgers, fish tacos, vegetable pasta, New Orleans-style Gumbo, sandwiches, salads and so much more. You might get lucky and see a little live music while you’re there. Day 2 is dedicated to exploring the stunning natural beauty of Saugatuck. Start your day with a climb at Mount Baldhead Park, where you’ll take a hand-pulled chain ferry across the Kalamazoo River and then ascend 302 steps to the top of Mount Baldhead for a breathtaking panorama of Saugatuck, Douglas, and Lake Michigan. Mount Baldhead also includes a pleasant one mile loop used for hiking, walking, and trail running. Of course, no trip to Saugatuck is complete without checking out its iconic sand dunes and beaches. The best place to go is Saugatuck Dunes State Park, which features 2.5 miles of secluded beach and 200-foot tall wooded dunes. You’ll find four trails, ranging from 2.5 miles to 5.5 miles, of varying terrain, including both steep slopes and rolling hills. For a fun and unique way to explore the dunes, consider Saugatuck Dune Rides. Saugatuck Dune Rides re-opens in May and takes guests on 40-minute, adrenaline-pumping adventures through some of the area’s finest dunes. If you’d rather lounge on the beach, try Douglas Beach Park, Oval Beach, Pier Cove Beach, or Laketown Beach. After your busy day outside, reward yourself with a satisfying meal at Phil’s Bar & Grille, a popular local hang-out with something on the menu for everybody. Don’t miss out on their fresh meat or fish dishes as well as great soups, sandwiches, and vegetarian mains. With its lively, welcoming atmosphere and friendly staff, Phil’s is the perfect place to go if you want a true taste of Saugatuck. Planning a trip to lovely Saugatuck, Michigan? Book a stay at the warm and welcoming Twin Oaks Inn, a historic bed & breakfast located just minutes from downtown Saugatuck.